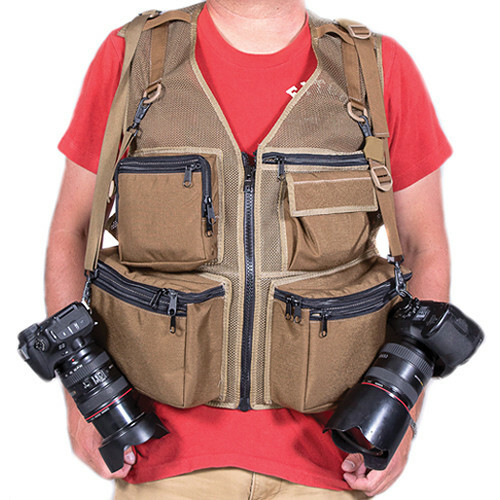 The coyote-mesh M&M Travel Photography Large Vest from THE VEST GUY can carry all your photo gears in the 14 pockets provided (12 outside and 2 inside), during local street photography or while traveling around the world. This vest comes with a hydration sleeve, which enables you to put 2 to 3l hydration system in it. It has a hook and loop fastener front and back, which enables you to personalize the vest with your name or your business name, or website. The two lower cargo pockets have both inside and outside zipper pockets. The upper pocket is on top of the outside zipper. The opposite side is a utility pocket, which has inside and outside zipper pockets with elastic inside to hold batteries and memory cards. A D-ring and a key clip inside the utility pocket allow you to attach things, if needed. In addition, the vest has a convenient carry handle and comes with a camera strap. This vest is adjustable from 40 to 58" at the chest and measures 24" from shoulder to waist. Box Dimensions (LxWxH) 12.1 x 10.8 x 8.9"
M&M Travel Photography Large Vest (Coyote-Mesh) is rated 5.0 out of 5 by 1. Rated 5 out of 5 by ALCAM-USA from Great Vest and Well Made! I've spent 24 years in the military and this vest looks like it could pass mil-specs with ease. It's built that good. It has all the bells and whistles a person would want on a photo vest. I especially like the compartment inside the back of the vest to hold a camelback hydration pack. Living in the Colorado Rockies I primarily use this vest photographing wildlife and community events. However, this vest would be an asset at sporting events, weddings, urban shoots and anything else where the photographer doesn't want to lug around a camera bag. The two large lower front pockets are big enough to hold a 70-200mm 2.8 VR lenses with room to spare or a large camera body such as a D800 with battery pack attached. So there's room enough to have 2 cameras on you. I purchased this Coyote Mesh vest in May 2014 but it looks a little different than the vest pictured. The zippers are not black but tan like the pockets. There is only one camera strap, not two. The mesh is green and not tan as pictured. I like mine better because it matches my surroundings better. My vest looks nothing like the camo vest pictured elsewhere. I'm thinking my vest may be a newer version of the Coyote-Mesh, that's all. I don't use the camera strap that comes with the vest. The D rings are plastic and not metal. I'm concerned about using plastic to secure a multi-thousand dollar camera rig so I use a Blackrapid shoulder strap instead. I also like the large outer Velcro pocket on the back of the vest. I use it for maps and lunch! This vest has a ton of possibilities due to its many features. I think anyone looking for a good vest instead of a bulky camera bag should definitely try out Vest Guy. I'm only 5'7, average build, weighing around 165 pounds and the medium vest was perfect on me. Can you please tell me where the vest is manufactured? According to the information we have, our current inventory's Country of Origin is USA. Please be aware this can change over the product's production life without notice.